How do modern spy planes evade detection? Whenever we hear about reconnaissance planes, descriptor such as "stealthy" and "slipping under the radar" are bandied around. But what actually goes into making stealth fighters undetectable, and what are the limits of this undetectability? The problem with attempting to make an airplane unobtrusive is that it's a giant hunk of metal attached to a jet engine. No amount of paint or muffling will change that. Altitude can obscure the plane from the naked eye, but then there's radar to be accounted for. So how do planes do it? By scattering, dimming, and confusing instruments enough to pass overhead without setting off alarms. To understand what's stealthy — when it comes to radar — it helps to know what isn't. Commercial airliners have very good reasons to appear on radar as quickly and blatantly as possible. They do this by being large, loud, and curved. Technically, the curves on a regular plane are there to smoothly guide the air over and around it — making it aerodynamic — but they also have the helpful effect of making the plane show up on radar. Radar works by sending out a wide electromagnetic wave into the atmosphere. When the wave hits an object, it bounces back. By measuring the size of the waves that come back and the frequency at which they come back, sensors can roughly estimate the object's size and motion. The major difference between radio waves and visible light is the size of the incoming waves. Visible light is measured in micrometers, whereas radio waves are measured in centimeters to decimeters. Mapping out a scene in meters will give you a more blurry picture than one picked out in every detail. What gets shot back to radar towers is the portion of plane that the wave hits head on, at a ninety-degree angle. When a wide wave hits a circle or the side of a cylinder — like the outer body of a plane — there is always going to be at least one section that it hits head-on. A circle literally covers all possible angles. This is why spy planes were, for a long time, tailored to look excitingly chunky, with long straight panels defining their body and wings. If the panels are straight and form certain angles with respect to the ground and the oncoming waves, the radar waves don't get reflected back to their station. Instead, they get scattered in small pieces, never adding up to a whole plane, which allows the plane go undetected. But there are curves, and there are curves. The stealth bomber - known as the flying wing - became popular because it turned the idea of reflecting back waves to radar stations on its head. The plane was squashed down to a wedge flying in the sky. Its engines and main body were incorporated into this wedge, taking away the cylindrically-shaped body that most planes have. Without this long, regular, cylindrical body, the plane's radar pattern changes. Take a look at a wing. You'll notice that the curve of the wing changes, getting sharper in some parts, longer and shallower in others. Instead of a radar hitting a big circle with one radius, it hits a bunch of different curves with different radii as the plane travels through the sky. So instead of a steady, regular pattern bouncing back, the radar stations see a flickering group of signals being shot back. The B-2 is a 172-foot plane that can be mistaken on radar for a flock of birds or insects. And its shape doesn't just confound radar. The plane's strange arrow design is mirrored in front and back well such that its shape can confound eyewitnesses. Atoms and molecules that vibrate at the frequency of the incoming waves tend to absorb what's coming at them instead of reflecting it back out. Carbon and iron tend to absorb radio waves well, especially when wadded up into little balls of carbonyl iron. These tiny particles, suspended in resin or plastic, were spread across the surfaces of crafts since World War II, but they only took care of some of the incoming radar. Across many reconnaissance craft are layered materials that form a honeycomb structure. These layers of honeycomb get every denser as they move inwards from the surface. These structures are designed to reflect radar in a particular way. Radar waves, like water waves, have peaks and valleys. Like water waves, if a peak meets a valley, they cancel out, leaving smooth water. The honeycomb layers reflect radar waves back out into the atmosphere, but do so out of sync with the way that they came in, so that a peak of an outgoing wave meets the valley of an incoming wave. The two cancel out, effectively erasing the incoming radar. A combination of absorption and precise reflection can be used to eliminate as much radar as possible. In the modern flying wings, another detail is obscured. Engines outside the plane leave exhaust trails that glow visible in infrared. Making the entire plane an aerodynamic wing gives the engines a break when it comes to overheating. Burying the engines deep inside the plane muffles them slightly. And as the exhaust leaves the engines, it's passed through multiple cooling systems and filters, obscuring its heat signature further. 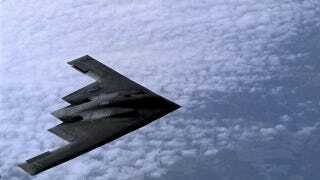 What's Next for Stealth Aircraft? The next generation of spy planes seem pretty improbable, but spy planes have always been defying expectations. One option is erasing incoming radar. Instead of passively canceling radar out, future plane may be able to detect it and send out a canceling, opposing pulse of radar. Another possibility is ionization. Radar doesn't move through ionized gas the way it moves through regular air. Ionization occurs when enough heat or electric potential runs through the air to separate electrons from their atoms. It happens often during lightning storms, which aren't optimal flying conditions. Simulating these storm conditions could allow future aircraft to further thwart radar. Top Image of B-2: U.S. Air Force photo/Gary Ell. Image of F-117 Nighthawk: U.S. Air Force Photo. Image of Carbonyl Iron Particles: University of Rochester. Via Airplane Design, Ohio University, HK, Science Buddies, and How Stuff Works twice.